Studied the classics and theology in Alexandria, Egypt. Deacon, secretary, and student of bishop Alexander of Alexandria. Attended the Council of Nicea in 325 where he fought for the defeat of Arianism and acceptance of the divinity of Jesus. Formulated the doctrine of homo-ousianism which says that Christ is the same substance as the Father; Arianism taught that Christ was different from and a creation of the Father, a creature and not part of God. Bishop of Alexandria c.328; he served for 46 years. 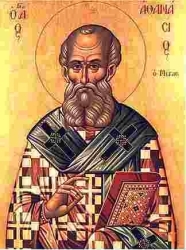 When the dispute over Arianism spilled over from theology to politics, Athanasius got exiled five times, spending more than a third of his episcopate in exile. Biographer of Saint Anthony the Abbot and Saint Potamon of Heraclea. Confessor of the faith and Doctor of the Church, he fought for the acceptance of the Nicene Creed. When he first tried to join the Dominicans he was refused due to his poor health. When he persisted, the prior told him he could only enter if he could recite the whole of canon law from memory; a year later, in 1405, after spending his time in study, he recited it and was admitted. Priest. Worked for the reforms of Blessed John Dominic. Vicar of the convent of Foligno, Italy in 1414. Prior. Member of the Council of Florence which sought to end the schism between the churches of the east and west. Vicar-General of the Dominicans. Archbishop of Florence, Italy in 1446. Diplomat. Theologian. Healer. Wrote a biography of Blessed John Dominic, a history of the world, and a reference work on moral theology. One of twelve children born to a farm family; six of his siblings died in childhood. Educated in Almería, Spain. Entered the diocesan seminary in 1876, and the Granada seminary in 1878. Ordained on 24 September 1887. Parish priest in Chinchón and Estremera. For nearly 20 years he cared for an elderly brother priest. Synodal examiner in Madrid, Spain in 1890. Taught metaphysics, Latin, and pastoral theology at the Madrid seminary. Chaplain to the convent of Saint Bernard. Pilgrim to the Holy Land in 1905. Entered the Jesuit noviate in Granada in 1906, and made his religious profession on 12 October 1908. Noted and sought after counselor and confessor, known for his parish ministry, spiritual direction, his devotion to the poor, and his excellent preaching that brought many to the faith. He served as spiritual director for groups of lay people, and from behind the scenes he helped them start academic and trade schools, find work for the unemployed, and minister to the sick and disabled. He organized missions and spiritual exercises, and worked to bring better financial and spiritual life to the poorest of the city. Born to the Swabian nobility. Her brother, Hatto, was a priest and provost of Saint Magnus church. Wiborada turned her home into a hospital for the sick poor people that her brother brought to her. Pilgrim to Rome, Italy. Benedictine nun at Saint Gall's monastery, where she worked as a bookbinder. Subject of virulent criticism, she eventually withdrew further from the world, becoming an anchoress first near Saint Gall's, then near her brother's church. Noted for her austerity, and a gift of prophecy, she drew many visitors and would-be students. One of her prophecies involved the Hungarian invasion of her region; her warning allowed the priests and religious of Saint Gall and Saint Magnus to escape, but Wiborada refused to leave her hermit's cell and was found by the invaders. Martyr. Lord of Baye, France. Studied at the abbey of Lérins, France. 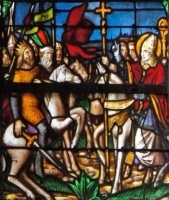 Worked with Saint Germanus of Auxerre and Saint Lupus of Troyes to fight the Pelagian heresy. Negotiated with Attila the Hun, and saved the city of Châlons, France from being sacked. Travelling evangelist, he founded several churches, hospices, convents and monasteries, brought many to the faith, and many to join monastic orders. Bishop of Châlons, France from 433 to 480, serving for 47 years. Parish priest in the diocese of Radom, Poland. His devotion to God and his fellow man led to his parishioners giving him the nickname Saint Francis of Radom. Arrested in January 1941 as part of the Nazi persecution of the Church, and sent to the concentration camp at Auschwitz, Poland where he died four months later from general abuse and mistreatment. He spent his time there ministering to other prisoners. One of the 108 Polish martyrs of World War II. Fifth century bishop in north Africa. Leader of a Council called to express clear defense of the Catholic faith during a period of pagan resurgence and Arian heresy. Envoy from the Council to emperor Honorius and emperor Theodosius. Exiled to the Mediterranean island of Corsica in 484 in the purges and persecutions of the Arian King Hunneric. Martyr. Son of John and Joan Tirry. Studied in Valladolid, Spain and Paris, France. Augustinian priest. He returned to Ireland in 1630, and worked many years as secretary for his uncle, the bishop of Cork. In 1654 he was assigned to Fethard, Tipperary. Arrested on Holy Saturday, 25 March 1654, and condemned to death for his crime of being a priest. One of the Irish Martyrs. Married to Saint Exsuperius. Mother of Saint Cyriacus and Saint Theodulus. Slave, owned by a rich devout worshipper of the ancient Roman gods in Attalia, Pamphylia. Zoe's job was to tend the house dogs and prevent them from biting visitors, and she rarely saw her husband as he worked the fields far from the house. Since she worked near a roadway, she gave of her own meagre rations to those even poorer than herself. One pagan feast day, the family of slave saints was given meat to sacrifice to an idol. They refused, and the entire family was tortured and murdered. Lay man farmer and catechist in the apostolic vicariate of West Cochinchina. Imprisoned when he tried to take the place of a hunted priest during the persecutions of Emperor Tu-Duc. Martyr. Married to Saint Zoe. Father of Saint Cyriacus and Saint Theodulus. Slave, owned by a rich devout worshipper of the ancient Roman gods in Attalia, Pamphylia. Field worker. One pagan feast day, the family of slave saints was given meat to sacrifice to an idol. They refused, and the entire family was tortured and martyred. Celtic hermit who moved to an isolated site in Cornwall, England where his holiness soon attracted the attention of the locals. He taught them Christianity and baptized them into the faith. The water source he used for baptism became one of the many holy wells that dot the region and serve as points of pilgrimage. A church built on the site in the 10th century was dedicated to his memory, which had been preserved by the locals. Born to the nobility, a member of the royal house of Seldenbüren. Founded and endowed Engelberg Abbey at Unterwalden, Switzerland. Benedictine lay-brother at Engelberg. Considered a martyr because he was killed on a trip to Zurich to defend the rights of the abbey. Bishop of Gafsa, Nicomedia (in modern Turkey) who stayed loyal to orthodox Christianity and opposed Arianism. Tortured and martyred by order of the Arian Vandal king Hunneric. Son of Saint Exsuperius and Saint Zoe; brother of Saint Cyriacus. Slave, owned by a rich devout worshipper of the ancient Roman gods in Attalia, Pamphylia. One pagan feast day, the family of slave saints was given meat to sacrifice to an idol. They refused, and the entire family was tortured and martyred. Son of Saint Exsuperius and Saint Zoe; brother of Saint Theodulus. Slave, owned by a rich devout worshipper of the ancient Roman gods in Attalia, Pamphylia. One pagan feast day, this family of slave saints was given meat to sacrifice to an idol. They refused, and the entire family was tortured and martyred. Brother of Saint Fursey of Péronne and Saint Foillan of Fosses. Fellow monk with them at Burgh Castle near Yarmouth, England. Missionary to Belgium where he served as a priest in the convent of Nivelles and worked with Saint Gertrude. Abbot at Fosses, Belgium. Abbot at Péronne, France. Monk. Abott of Luxeuil Abbey c.628. Worked with Saint Salaberga to found the convent of Saint John the Baptist in Laon, France. Convert, brought to the faith by Saint Germanus of Auxerre, in whose honour he took the name Germanus. Bishop. Martyr. Brother of Saint Cadoc of Llancarfan; may have been the nephew of Saint Petroc. Monk. Sent to Cornwall by Cadoc, he founded the monastery and parish now know as Saint Glywys. May have been martyred; records are unclear. Bishop in north Africa who stayed loyal to orthodox Christianity and opposed Arianism. Tortured and martyred by order of the Arian Vandal king Hunneric. Martyr. No details have survived. Bishop of Tlemcen, Mauritania who stayed loyal to orthodox Christianity and opposed Arianism. Tortured and martyred by order of the Arian Vandal king Hunneric. A relative of Saint Patrick. Present at Patrick's death. Benedictine monk at the abbey of Sithiu, France. Spiritual student of Saint Bertin the Great. Mercedarian who freed 99 Christians from slavery in Muslim Numidia. Commander of the Mercedarian convent of Saint Eulalia in Seville, Spain. A group of Christians marytred together in the persecutions of Diocletian. We know little more than their names - Celestine, Germanus, Neopolus and Saturninus.